​Who Really Made the Chopper From Easy Rider? This Saturday the last Easy Rider chopper will go up for auction, and as the lone survivor, it's expected to fetch something north of $1 million. But 45 years after the film was released, the builders behind "Captain America" are beginning to get the recognition they deserve. When it comes to bike builds, it's an ego-driven world. But that doesn't mesh with old school Hollywood, where the people behind the scenes don't get much credit. In the case of the Easy Rider choppers, it's been a long, drawn out battle to bring the creators to light. NPR dove into the murky history behind who constructed one of the most iconic motorcycles in existence, where two names continued to surface: Clifford "Soney" Vaughs and Ben Hardy. Vaughs was a bike designer and Hardy a prominent builder in LA, both of whom have had brief flashes of recognition on TV and in print in the past few years. Hardy died in 1994, but Vaughs sat down with NPR to tell his story, which started when he was covering Peter Fonda's marijuana arrest in 1966 while working for a local radio station. There, Fonda and Vaughs got to talking about bikes. Not long after, Vaughs says, Fonda and Dennis Hopper came by his apartment in West Hollywood, and discussed early plans for a motorcycle movie, and building the bikes they would need. "I said, 'Well, I can build whatever we need for the film right here at my place,'" Vaughs remembers. The film was Easy Rider, but the story isn't nearly that clear cut. Or as producer Bill Hayward said before his death in 2008, "The whole movie, the whole production ... everyone's got an entirely different story." Fonda claims to have had a hand in the build, telling Fresh Air in 2007 that, "I built the motorcycles that I rode and Dennis rode. I bought four of them from Los Angeles Police Department. I love the political incorrectness of that ... And five black guys from Watts helped me build these." Hopper disagreed at some point, crediting Vaughs with the production of the bikes – three total, of which one remains – as does Larry Marcus, a mechanic who lived with Vaughs at the time. 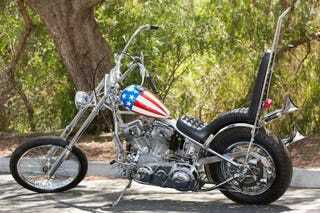 The iconic red, white and blue stars and stripes panhead chopper, with chromed hard tail frame, was designed and built by two African-American chopper builders — Cliff Vaughs and Ben Hardy — following design cues provided by Peter Fonda himself. However, neither Vaughs nor Hardy have ever been officially credited for the build, nor were they included in the credits. But Vaughs seems to have made peace with his exclusion. "I'm a little miffed about this, but there's nothing I can do," Vaughs told NPR. Saying that he only spent about a month working on the bike, and that didn't amount to much in a "long and illustrious life." Check out the full story, along with the accompanying All Things Considered piece over at NPR.